New Zealand’s rugged, weather-beaten coastline was perilous to ships arriving in the mid-1800s, and many were wrecked before lighthouses were considered an urgent government concern. The establishment of a national lighthouse system has been a heroic enterprise. Starting out as a lamp tended in a cottage window, lighthouses are now highly technical and wholly automated. Lighthouses were built on coasts to warn ships about rocks or reefs, and show where a harbour entrance is. They are also important landmarks, helping ships’ crews work out their distance from land and the speed they are travelling. New Zealand has a rocky and sometimes stormy coastline, which endangered lives and cargo. Soon after settlers first began to arrive in the 1840s, they began demanding lights and beacons. 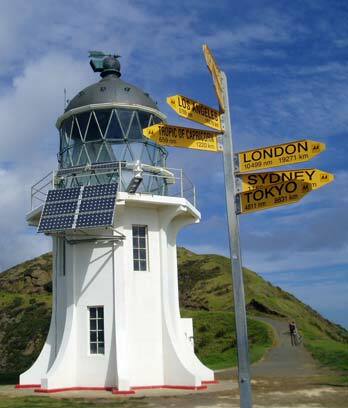 The first lighthouse was opened at Pencarrow Head, at the entrance to Wellington Harbour, in 1859. After two marine boards (established in 1862 and 1863) proved unsatisfactory in building and looking after lighthouses, the New Zealand government established the Marine Department in 1866. However, James Balfour’s early death robbed the new department of an exceptional lighthouse engineer. Balfour believed that lighthouses should be cheap and easy to build. His successor, John Blackett, found places to build them. Putting up lighthouses was often difficult. They were built on exposed areas with no nearby roads, so wood and other materials had to be delivered by boat, sometimes on dangerous seas. New Zealand’s first lights were oil lanterns, soon followed by kerosene burners. To increase the amount of light, their beam was focused through large glass lenses. In the 1935, electric lights began to be used. Each lighthouse flashed them in a special sequence so that sailors would know which lighthouse they were seeing. Today, solar panels provide the power for the lights. Until the lights became electric, keepers worked long hours making sure the oil lanterns did not go out. They also cleaned the lights, and looked after the lighthouse tower and any buildings and farmland nearby. Keepers’ wives helped out. When electric lights began to be used and automated systems were installed, many keepers lost their jobs. There are no longer any keepers. Today, New Zealand has an effective, automated system of lights.